An article about Andre Haidu - by Gideon Lewensohn. I met Andre Haidu for the first time in Jerusalem at his home in 1989. He told me at that time that music is like a mountain whose peak we can never reach. This meeting gave me wings; the strength to come live in Israel to study with him. A pupil of Zoltan Kodaly and Olivier Messiaen, Haidu is a sort of Bela Bartok of Chassidic music. Like his illustrious example and compatriot, he has been collecting a lot of niguns, spiritual melodies of various chassidic groups as well as from many other Jewish/Israeli communities. From this material he composed originals pieces. He wrote a very interesting study about the Meron Nigun and composed pieces on Mishna texts. 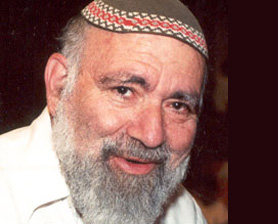 Haidu is a great improviser too and has a phenomenal encyclopedic knowledge in both Torah-oriented and secular realms. When I first began to learn with him I was a little disappointed. This was the time of the Oslo Accords, prior to the assassination of PM Rabin. At that time, Israeli society was not, on the whole, interested in that which is connected to religion. I had come to Haidu for his piece "The soul descends into the body" created around a Lubavitch (Chabad) nigun. However, Haidu was more interested at that time to be recognized beyond Israeli borders, to become an international composer. I have heard that he has recently returned to the music of the nigun and leads a band composed of some of his former students. They improvise on Chabad niguns. Could my own Techelet Ensemble experience have influenced him? Who knows? But what I do know is that the listening of that same piece I speak of, "The soul descends into the body" is what inspired in his students a strong desire to work on nigun melodies. - the Neshama Yoredet Betoch ha guf ("The soul descends into the body"). Andre Hajdu was born in Budapest (Hungary) in 1932. He studied there at the Ferenc Liszt Acadamy under Szervanszky and Ferenc Szabo (composition), Szegedi (piano) and Zoltan Kodaly (ethnomusicology). In 1956 he emigrated to Paris and continued his studies at the Conservatoire National de Musique under Darius Milhaud (composition) and Olivier Messiaen (philosophy of music). Since 1966 he lives in Jerusalem. He taught at the Rubin Academy of Music both in Tel-Aviv and Jerusalem. As a researcher he studied Gypsy folk music and Jewish klezmer and hassidic repertoires and published several articles on these subjects. As a composer he wrote a great deal of compositions consecrated to Jewish topics (Ludus Paschalis, Jonas, The false prophet, Dreams of Spain, Job and his comforters, Mishna songs). Several books are consecrated to music teaching through a creative approach (involving the player in the process of composing) such as "Milky Way", Art of Piano Playing, "Book of Challenges", "Concerto for ten little pianists". His compositions were played by Orchestras and Ensembles such as the Jerusalem Symphony, Israel Chamber Orchestra as well as the Philadelphia, Leningrad, Berlin, Stockholm and Munich Philarmonics. Works available in CD: On Light and Depth (IMI), l'Ecclesiaste (RCA Victor-BMG), Teruath Melech (Plane), Dreams of Spain and Concerto for an ending Century (Hungaroton). In 1997 he received the Israel Prize for his lifework. In 1977, the distinguished Israeli composer, André Hajdu, completed a rather surprising orchestral score entitled "Stories about Mischievous Children. " It took both the orchestra (the Israel Chamber Orchestra which had commissioned the work) and the audience by surprise. Its blunt affinity with the symphonic gestures of Gustav Mahler and Richard Strauss, and the introspective focus on childhood in a work for adults, were aesthetically and sociologically quite unprecedented in Israeli concert music. For Hajdu, looking back into the 19th century was a reflection of his seeking his own personal past, allowing it to float up and partake in the creative process. "Stories about Mischievous Children" shows how Hajdu the child had his personal memories; however, as a musician, his musical memories are no less intimate and dear. Writing about André Hajdu does not just acknowledge his immense musical contribution to the repertoire of Israeli music: it also acknowledges his unique contribution to an important cultural and spiritual evolution taking place in Israel. In early Israeli culture - the still new society armed with ideology - childhood was not a particularly welcome focal point. Israeli poetry, which was geared towards ideas and ideals, did not nurture any "I," not even with great poets like Uri Zvi Greenberg or Nathan Alterman. Poets such as Rachel and later Leah Goldberg, did focus on the "I" but then they could afford to, they were women after all... Men were to build a new reality in the old-new land and could not afford childhood to blur the vision with tears. It took a while for a younger generation of poets, from Natan Zach to Yona Wallach, to acknowledge the "I." The "I" in Israeli music is now gaining increasing presence as a kind of post-modernist response to the "I" in poetry. Hajdu was the one who planted some of these seeds in the two Rubin music academies in Jerusalem and Tel Aviv where he taught. Later, he stopped teaching there and has been focusing on his work with composers at Bar-Ilan University and at the High School for Arts and Sciences in Jerusalem. However, his impact on the younger generation of composers and performers goes far beyond those who attended his classes over the last 28 years. Hajdu is so uniquely ordinary that one may justifiably suspect he is hiding a huge enigma. He detests any kind of uniform and will not easily surrender to any dress code, be it elegant or casual. His kippa (skullcap) is of the knitted type, very popular in nationalist religious circles. Its position on his skull, just above his forehead, makes this trivia very special. Professor David Flusser, an expert on early Christianity and a close friend, once remarked that with this particular positioning of his kippa, Hajdu reminds him of a mediaeval saint. Some 40 years ago, Hajdu was destined to become a national Hungarian composer when his gypsy cantata won an international prize in Warsaw. Instead he left for the west, graduated from the Paris Conservatory, and immigrated to Israel in 1966. As a young and promising student of Zóltan Kodály at the Franz Liszt Academy in Budapest, he followed in the footsteps of the two giants, Bartók and Kodály. Armed with notepaper, pencil and romantic fervour, he made trips to remote villages in search of treasures he later discovered in his own heritage as well. These adventures turned out to be very significant in his development. Theodore Adorno points out in his writing on Mahler that the use of Chinese elements in Mahler's work tends to a sublimation of Jewish identity. The psychologically safe exploration of the musical childhood of the gypsies, as well as other ethnic groups, was a preparation for a more difficult and demanding exploration of the childhood of his own Jewish people. It is important to realize that the Bartokian and Kodalian interest in ethnomusicological research was not just an extension of national trends in Europe but also a recognition of the crucial importance of childhood in the psychology of the individual and the community. In 1970, already in Israel, Hajdu tried to integrate ethnomusicological and psychological awareness in his compositions. Testimonium, a musical festival dedicated to the Jewish heritage staged his Ludus Pascalis, a miniature opera for men and boys' choirs, soloists and instruments, featuring texts from the Talmud, the Psalms, mediaeval Passover games and a variety of musical sources ranging from Christian hymns to Talmud study chants. No musical stage in Israel had yet experienced an artistic confrontation with history and identity to such an extent. The use of children on stage gave a psychological impact without precedent. Budapest was the womb from which Hajdu emerged and is the centre of his pendulum occillation from west to east. The orient-occident dialectic so typical of Budapest is a central feature in his cultural make-up. In a way, Budapest always remained part of the Austro-Hungarian Empire and a centre of its heritage. Yet it also contained the Magyar Asian elements which appealed so much to creative minds like Bartók and Kodály. This dialectical relationship was also reflected in the divergent backgrounds of Hajdu's parents, and, needless to say, this duality had a strong impact on his personality and development. Andreas, known to all as André, was born in Budapest in 1932. His mother belonged to the upper-middle class Jewish community. Anything western was idolized and German was the spoken language at home. His father, on the other hand, came from the Debreçen area of the eastern Hungarian steppes, which is much less European than the rest of the country. His parents separated when André was a child and he was raised mainly by his mother. When he was 12, his mother, herself a piano player, sent him for piano lessons. These, however, were soon interrupted by the Nazi invasion of Hungary. André and his mother found shelter in a house which was protected by the Red Cross. After more than once miraculously escaping deportation to a concentration camp, they were sent to a ghetto just ten days before the Red Army entered Budapest and rescued its inhabitants from impending starvation. In Budapest, André enrolled in the piano class of Mme. Kadosa at the Franz Liszt Academy. Kadosa was a very conventional and rather rigid piano teacher, not exactly compatible with Hajdu's effervescent personality. Fortunately, his rebellion took a positive turn and he developed a profound interest in improvisation and composition. This led him in 1949 to the composition department of the Academy. The intellectual and artistic climate was very favourable and Hajdu befriended the painter Tibor Csernus and the architect Miklós Erdely who later became a leading avant-garde artist in Hungary and had a lasting influence on him. As the pendulum of Hajdu's life swings, we find two other important cities. Paris to the west and Tunis to the east. In 1956, Hajdu fled Hungary in the hope of getting to London, but the lines at the British consulate in Vienna "were so long" that he settled for Paris instead. This typically offhand anecdote as Hajdu himself told it to me, expresses a childlike, impatient, nonchalant attitude towards reality. The impulsive choice turned out to be of great significance for him in terms of his cultural and intellectual development. For Hajdu, who was raised in an atmosphere which glorified the occident, Paris was the ultimate west: literature, theatre, opera, film and the Parisian cafés with their high intellectual voltage. One could sit for hours, think or argue, even if that meant less time for composition. Indeed, a look at Hajdu's Parisian oeuvre shows no more than ten works over a period of ten years, yet nearly every one marks an approach, a mode of thinking which was unique and which was developed later on. Babeliana (1964) anticipated Mishnayoth (1971-72) in its stylistic diversity; Petit Enfer (1959) anticipated "On Light and Death" (1983-84) and Continuum. A guitar piece, Microcosmos (1965) anticipated five volumes for piano entitled "The Milky Way" and the Piano études (1975-86) and the "Book of Challenges" (1994). All of these works have in common the notion of the child and the pendulum, and they truly acknowledge either the child in the composer or the composer in the child. At the Paris conservatory, Hajdu studied under Darius Milhaud and Oliver Messiaen. Among his class mates were Gilbert Amy, William Bolcom, Philip Corner and Paul Mefano, to name just a few. In Paris he met a variety of stimulating people from the playwright Samuel Beckett to Prof. Israel Adler of the Hebrew University, who brought him on his first visit to Israel in 1966. Though neither Milhaud nor Messiaen taught composition in the strict sense of the word, both made a lasting impression on him. Milhaud's nonchalant imperturbability, his personality as a composer whose work is brilliant and skillful but never pathetic, echoed and reinforced Hajdu's own leanings. This attitude allowed Hajdu to develop a stylistic diversity that contrasted strongly with the contemporary striving for "a new language" as a supreme value. Messiaen, a devout Catholic, attributed great cosmic significance to every sound and devised a theosophical theory of musical composition. The relationship with Messiaen was complicated. His qualities and knowledge were of great inspiration yet the hermetic system of metaphysical application in his music was quite unacceptable to Hajdu who wanted to maintain the swing of the pendulum. During the Paris period, Hajdu visited London, Darmstadt, Vienna and Biarritz. The eastward swing of the pendulum in the direction of Tunis was a result of job-seeking; however it turned out to be a critical step in the preparation for Jerusalem a few years later. The Music Conservatory in Tunis offered him the job that Paris had not. It also offered him an opportunity to live in a place free of dense western intellectualism and projections. Form no longer mattered that much. There was a meditative improvisando state to replace it. In 1969 in Tunis, he composed the "Diary from Sidi Bo-Said" for piano solo. Another achievement was discovering a yet unknown type of Jew: not the cosmopolitan Hungarian Jew or the assimilated French Jew, not even idealistic Zionists or the religiously observant; but just "ethnic" Jews, clearly part of a "people. " Upon his return to Paris in 1961, a heightened interest in Jewish studies started to develop, while on a job as a film composer in Rome working on a Canadian feature which was being filmed in Greece. The editor was a bright and scholarly observant Jew who brought the work to a halt every Sabbath eve. One Sabbath afternoon he introduced Hajdu for the first time in his life to the Talmud. Upon his return to Paris, he started attending a beginners' class in Talmud. In Jerusalem, Hajdu met the composer Joseph Tal who was thrilled with the score of Petit Enfer and immediately contacted Prof. Oeden Partos, the director of the Rubin Academy in Tel Aviv. A job offer at the academy ensued and Hajdu settled permanently in Israel. For almost two years Hajdu indulged in a very intense but private study period of the Mishna (Jewish oral law codified in 200 ce), not in the traditional study hall, but at his piano at home. The result was the cycle, "The Floating Tower, " 56 settings of mishnaic texts for voice with piano, chamber music combinations and orchestra, as well as choral settings. The stylistic versatility ranges between Renaissance and 20th century music. Hajdu introduced "childhood" into Israeli music and musicology. He wrote music using recollections of music from the past and he began composing "new" music that young pianists wanted to play. He introduced improvisation, outside the jazz genre, into the curriculum at the Rubin Academy. He spent days and nights researching hassidic music at a time when only "oriental" Jewish music was considered a politically "correct" topic. Finally, he introduced texts from the mishna into the repertoire of Israeli choral ensembles. Israeli culture woke up one morning and to its amazement found its socialist-inclined irreligious kibbutz members singing texts from sources that were still considered culturally "dangerous." At the same time, Dan Almagor wrote a show of hassidic songs and stories presented by young Israelis in jeans and playing guitars. East European Jewish folklore was "rehabilitated." Next was to come the awakening of "ethnic" expression of sephardic Jews as a legitimate expression of Israeli society. The childhood of Jews as a collective as well as individuals started a revolution which ignited a powerful interest in the religious childhood of the Jewish people. For Hajdu, all history, whether personal or national, is a kind of childhood. This becomes clear when we realize that for Hajdu music has its own childhood and perhaps its own nightmares. The tick of the metronome, marking passing time in our western linear minds, is not permitted to take over. The child with his fantastic perception of events must stay along, and his voice must be heard regardless of adult perplexity or embarrassment. No mistake should be made, Hajdu is not naive, as neither Mahler nor Chaplin were. Childhood as a focal point, overt or hidden, is not necessarily an indication of naivété but may also serve as a sophisticated method of manipulating the defense mechanisms of both the speaker and the listener, the composer and the audience. In Hajdu's idiomatic world, the theatrical function of the child appears again and again. It is a boy soprano who sings a mishnaic text about women dying in labour in "The Floating Tower." At the end of that mishna, the orchestra bursts out in a typical Mahlerian sigh, while the boy singer abandons words and concludes with syllables. The effect is irresistible and the audience is left to choose between a smile, a tear, or both. The Christian children in Ludus Pascalis come back, 20 years later, in his cantata "Dreams of Spain" (1991). This semi-staged cantata deals with one of the most cataclysmic events in Jewish history, the expulsion from Spain of 1492. The mature Hajdu now chose an almost operatic grand gesture which clearly marked a new level in his development. This successful attempt paved the way for his next great work, an oratorio, "Job and his Comforters" (1992). Utilizing Jewish themes, whether textual, conceptual or purely musical, is part of one unified quest which constitutes a dialectical search for both the personal and the communal childhood. Looking into the past was always a dignified and cautious objective of Israeli literature and music. But for years, Israeli artists and musicians were very anxious to be considered serious and were reluctant to dive into childhood, a step that carries the risk of having unwanted childhood traumas come to the surface. To conclude on a more universal tone, I would like to suggest that one can understand through Hajdu's idiom of "Child and Pendulum" the tragedy of much of contemporary western music, an art which in the last few decades has systematically locked itself away from its childhood. By reducing the power of musical memory, nostalgia and recollection and through the use of theoretical models and systems, both technical and aesthetic, in the process of eradicating childhood from the agenda of the contemporary composer, the music lover has found himself as a deserted child in an unknown land not having any tools to engage in a dialogue with his environment. It is possible that Hajdu's obsession with childhood in his composition and teaching is his response to the alienation he felt visiting Darmstadt's avant garde festivals in the 1950s. This alienation is shared by many music lovers today and perhaps we need a sensitive child to detect it and cry out. Perhaps André Hajdu is that child?